Yesterday was Black Friday and my Big Box did very well. Place was jamming all day long, with every cash register ringing like the Bells of St. Mary. It was so busy they asked me, along with most of the early shift, to stay for eight hours. It wasn't as awful as I thought it would be. In fact, on some level it was sort of nice, in the way that people bond during a disaster. Customers were mostly patient and good natured about the lines. They had managers standing at the front the whole time so you could resolve customer complaints without chasing anyone down. And I rang up so many sales that I had to break two rolls of quarters and three rolls of pennies, which never happens. And especially remarkable since the bulk of my sales were on credit and debit cards. Worked five hours on Thanksgiving too. It was almost as busy since they were running a one day sale. And I've got another six hour shift today. Hoping my back holds out. It's a little twingy this morning and I don't have a day off until Wednesday. Anyway, I've never worked retail before and Lord knows I've never shopped in the stores on Black Friday, so I'm glad in a way to have had the experience but it's not one I want to repeat. If you're the praying sort, pray that I get a decent job soon and don't have to go through that again. And if you don't pray, send a good thought into the universe for more meaningful -- and better paying -- employment for me in the near future. Thanks. The Leonid meteor shower was at its peak last night. I went out a few times to check out the sky, which was brilliantly clear. Sadly, I didn't see a single one. Of course I don't have a wide view of the heavens where I live right now, but on the bright side, I did see the stars, even with the moon so bright I could make out the constellations. And on my last trip out, just before dawn, I heard a hoot owl. So there's that. Meanwhile, I found this picture of Key West on twitter yesterday. Reminded me of the trip I took to Key Largo a long time ago. I tried to drive down to Key West while I was there but didn't make it past Islamorada. 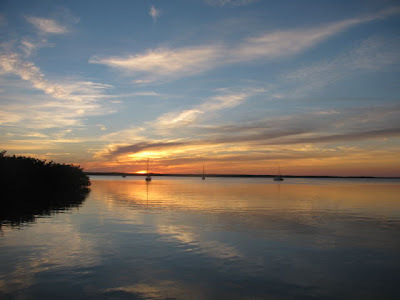 But all sunsets in the Keys look pretty much like this and everyone stops to watch. Just had two days off in a row. Don't know what happened to them. I have so much on my to-do list that still didn't get done. Why is it that time off flies by and work time drags so? But it's back to work today for another six day run before I get one day off. Did get some necessary shopping done though. Most exciting buy was my new flannel lined, black felt slippers. Exact replica of last year's model. Paid $1 more. Worth it for warm feet. I was lucky. Once again, they were the last pair in the store. And I really needed them. I was holding the old ones together with duct tape after the bottoms all cracked up. Went to Aldi for the first time. Wasn't anything like I expected. Thought it was going to be big and dark and warehouse grim with giant purchases required, like a Costco deal. As it turned out, it was smaller, cleaner and less depressing than the little Food Lion that's closest to my house. AND I got some great deals on food I needed. Went to to look for cans of unflavored seltzer water, which the Food Lion seems to have stopped carrying and I take to work every day for my break. Sadly, they don't carry it either, but I scored one of those little bears of Canadian honey, a great big can of Mexican coffee, and some dairy items for at least seven bucks less than it would have cost me at the regular grocery. And you can buy in small amounts. Some of the packaged stuff looks suspiciously like it could come from China, but the dairy and produce looked great and was really cheap. I'll go back again. Meanwhile, I haven't had a little city story in while. It seems my local high school is winning their sports competitions. Last couple of games they've been cheering so loud I could hear it from my porch. And much banging of drums and tooting of tubas. Pretty sure I also heard a vuvuzuela in the mix. Keep thinking I should go over to check out a game, but they seem to start and run really late. Too dark and cold for me. Oh and if you missed this, it was the best video I saw on the news all week. They were taking down this tower in Ohio and it was supposed to implode and collapse onto itself. But something went wrong and the tower tipped over sideways. Took out a bunch of power lines but miraculously didn't smash any of the houses or any people far as I've heard. You have to watch it to see how close it came to being a major disaster. Moving the clocks always make cranky. Even though this change gives an hour extra sleep, it means it will be dark so early that it will be even more depressing. And it's freezing here today. Heat running just to keep the main part of the house at 60 degrees. Almost successfully blocked out that this was happening. Didn't even think about it until I saw people talking on the internets this morning. On the bright side, at least I won't show up to work today, an hour early. On the not so bright side, thinking it's going to be a zoo at work today. The computers(cash registers) have been a mess for days since the gurus came in to "fix" them. Crashing regularly. Sundays are always horrible because the sales change and either people misread the circular or the computers don't ring the sale items up correctly. PLUS they're running a special promotion today offering 10% off on everything -- except -- a whole bunch of items. And customers have already gone into their holiday cranky mode. AND I have a late shift so I have to deal with the weekend night crazies. Glad it's a relatively short shift and at least I don't have to close.